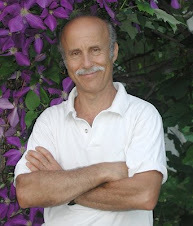 I’ve been a fruit nut for a long time, and throughout that time have had a particular attraction to uncommon fruits (about which I wrote a book). Evidence of the latter began with the planting of a mulberry tree in my front yard when I lived in Wisconsin. The plant and fruit seemed intriguing; little did I know, back then, that mulberry trees were growing all over the place. Right now, I could probably bump into a dozen wild trees within a quarter mile of here, or within a quarter mile of my old domicile in Wisconsin. Mulberry is the second most common “weed” tree in New York City. and some trees have better than run-of-the-mill flavor. The latter are available as named varieties. Which is why I could be seen today bending flexible poles aver two small trees. Mulberry fruits are a favorite of birds; I needed to protect the fruits. The two trees -- the varieties Oscar and Kokusu -- allegedly bear delicious fruits. 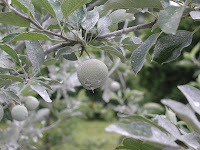 Taste of the fruit from these small trees will confirm whether or not they are worth keeping and growing into larger trees. If worth keeping, the trees, once large, will bear enough for the birds and humans. My bird protection was easily erected. 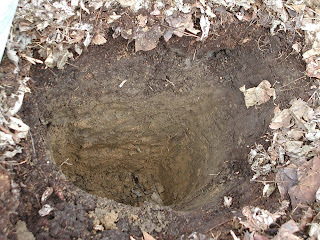 The ends of the flexible poles, in short sections held together by an inner elastic cord (from www.gardeners.com), like tent poles, went into foot-long pieces of PVC pipe that I pounded into the ground. Clothespins hold bird-netting in place on the poles and metal staples pinned the netting to the ground. Three species of mulberry are commonly eaten: white mulberry, Morus alba; red mulberry, M. rubra; and black mulberry, M. nigra. (Fruit color has nothing to do with species names; many white mulberry trees bear black fruits.) In the eastern part of the U.S., we find our native red mulberry as well as white mulberry, introduced from Asia in the early 19th century, as well as hybrids of the two. 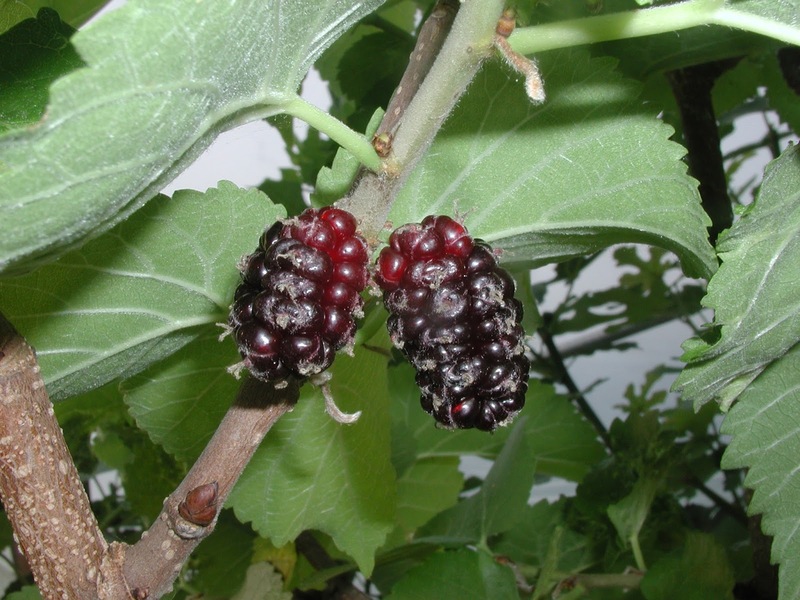 Black mulberry thrives best in Mediterranean-type climates. 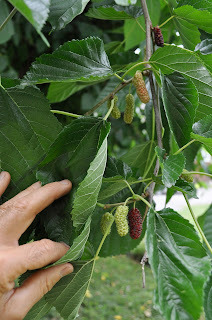 Right next to my two little trees I have an older mulberry, the variety Illinois Everbearing, a natural hybrid of the white and red mulberry species that does indeed bear over many weeks. 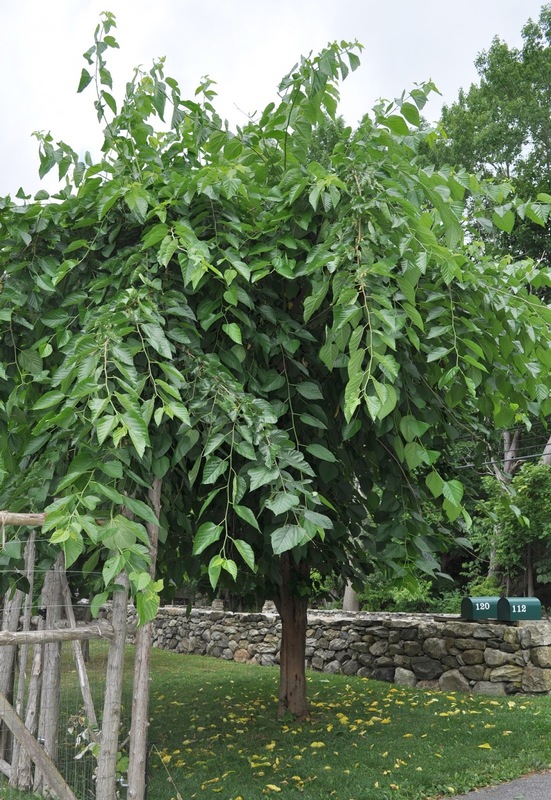 My Oscar tree is probably a variety of white mulberry. Kokuso is sometimes listed as its own species, M. latifolia. At any rate, all three varieties are supposed to be hardy and delicious. I can vouch for Illinois Everbearing because I’ve grown it for a number of years. Although hardy, branches often die back because they don’t realize, towards the end of summer, that it’s time to slow down growth and toughen up for winter. I make it slow down as summer wanes by letting grass and weeds grow high at its feet, sucking up excess moisture and nutrients. The best-tasting of the mulberries, I’d even stick my neck out so far as to say perhaps the best-tasting of all fruits(! ), is the black mulberry species. The berries aren’t particularly big but they pack enough flavor that they could be the size of an orange. Their flavor has a nice balance of sweetness and tartness along with some . . . je ne sais quoi. Mulberryness? mulberry to a tidy form, develop a main set of limbs, then prune branches growing off these limbs to six leaves in July to make short, fruiting spurs.” Not so! I garnered that pruning information from a British book, and it’s evidently is another gardening Britishism that doesn’t work on this side of the pond, probably due to differences in daylength and/or summer temperatures. My tree has done nothing but grow and grow, with little fruit on the abundant, lanky stems. This week I ripped the black mulberry out of the greenhouse and planted, in its stead, a fig to accompany the three other in-ground figs there. Everbearing tree. Black mulberry isn’t supposed to be cold-hardy outdoors here, but who knows? It’s a very long shot. As I said, I can’t believe everything I read, even if I wrote it. This time I hope that all of us are wrong. Anyone visiting my garden a few days ago might have thought they happened upon a moon landing or extraplanetary explorer. A two-legged creature was wandering around in bright blue pants and a bright blue, hooded jacket (actually, rain gear) with goggles and a respirator and 4 gallon tank strapped to its back. Periodically, an engine whine was accompanied by a cloud of mist (a jetpack)? trees. In this part of the world, sad to say, that’s generally what’s necessary to get a decent -- sometimes any -- crop of apples or plums. Some years I grow these fruits organically; some years I grow them, as some commercial growers say, ecologically or biologically. My organic approach is to spray a special formulation of kaolin clay, called ‘Surround’, and sulfur, a naturally occurring mineral. ‘Surround’ keeps insects at bay; sulfur does the same for some diseases. To be effective, ‘Surround’ must be maintained as a dust-like, white coating on the trees. This laid-back Mediterranean look to the trees necessitates a not very laid-back 3 sprays, before bloom, to build up a base layer, and followup sprays every week or following as little as 1/4 inch of rainfall. Even then, in my experience, control is marginal. Back to my moon suit . . . The suit is necessary no matter what I spray. Getting doused with, or breathing, even something as benign as kaolin clay is not good. And the jetpack? That’s my backpack sprayer. Spraying anything is no fun. Fortunately, except for the apples and the plums, spraying is almost never needed here on the farmden. Also fortunately, my sprayer makes easy work of the job. 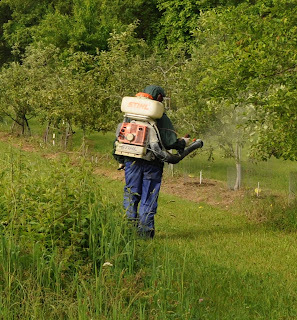 It’s a Stihl, gasoline-powered backpack sprayer that always starts right up, gives good coverage, and lets me, in less than a half an hour, mix the spray, apply it to about 2 dozen trees, and thoroughly clean it. mulches of compost, wood chips, hay, and other organic materials. The mulches feed the plants as well as worms, fungi, and other “good guys” in the soil. 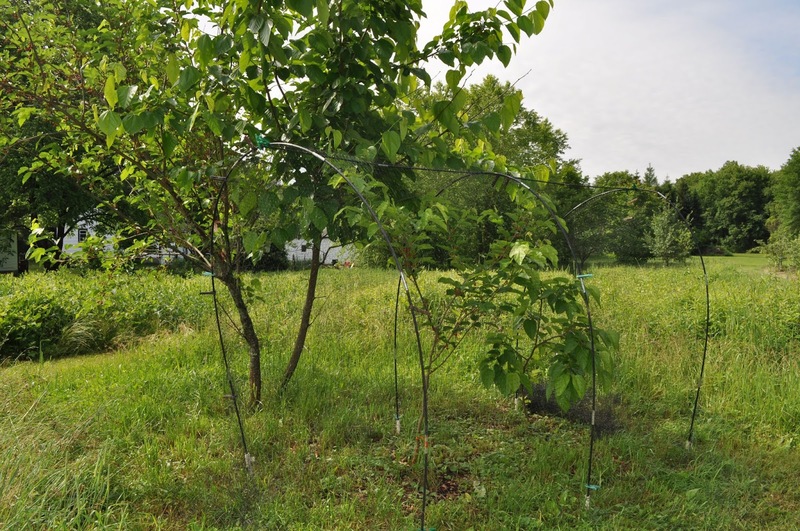 Above ground, pruning lets branches bathe in sunlight and air, both of which make for better fruit and conditions less conducive to insect and disease problems. If my plants are thirsty, they get water. 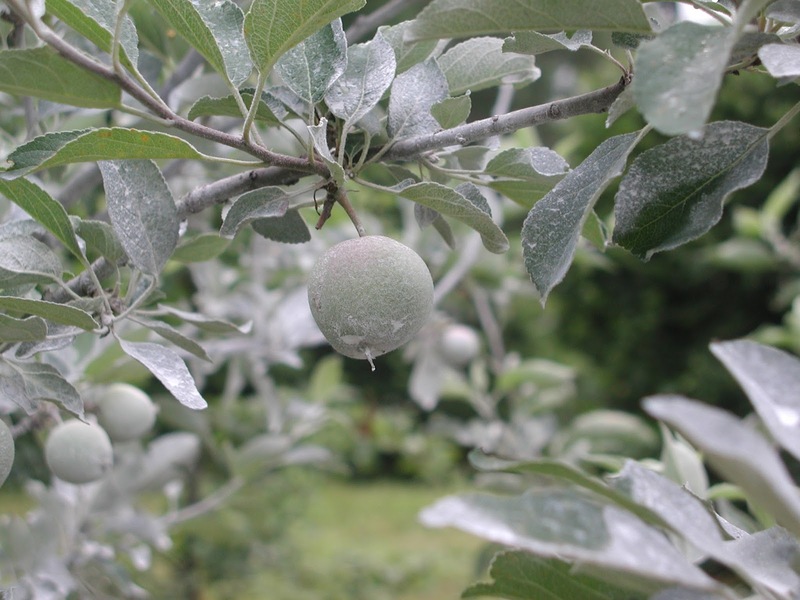 For apples and plums in this part of the world, all three requirements for pest problems -- pest presence, susceptible host plant, and environment suitable for the problem to develop -- are generally fulfilled. Hence, the necessity of sprays. Still, using a minimum of carefully selected sprays and needing to “ship” my fruit no more than 200 feet from the trees to my mouth (or kitchen) makes for a minimum affront to the environment. People too often equate “fruit growing” with growing apples. That should not be the case because there are plenty of other fruits, and plenty of them can be grown with hardly a thought to pest control. Pears, for instance. I have about 20 pear trees; none require spraying. The same could be said for blueberries, raspberries, persimmons, cornelian cherries, blackberries, pawpaws, hardy kiwifruits, gooseberries, currants . . . I could go on. In some cases, such as grapes, choosing a disease-resistant variety is the way to avoid having to spray. 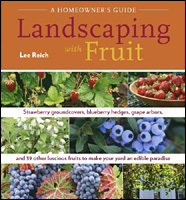 As I emphasize in my recent book, Grow Fruit Naturally, choosing plants adapted to your site is a very important part of growing fruit naturally, as is providing optimum growing conditions. Last minute notice: Come visit my farmden, in real life. As part of the Garden Conservancy Open Days program, I'll be hosting visitors between 10am and 4pm. For more information about this visit or other sites, contact the Garden Conservancy (www.gardenconservancy.org). Letting a few clematis plants grow is the closest I’ve come to playing the lottery. It looks like I’ve won, judging from the first flower that opened last week. Let me explain. I have a half dozen or so clematis plants of named varieties that I got from nurseries. A few years ago, I started noticing small plants -- seedlings of the named varieties, especially from near a Nelly Moser plant -- sprouting near the mother plants. I meant to save a couple, I even transplanted some, but these first seedlings succumbed to neglect. More recently, I’ve paid closer attention to the seedlings, especially those that sprouted fortuitously near the fence around the vegetable garden. my plant named Nelly Moser, are propagated by cloning. That is, every Nelly Moser plant is genetically identical to every other Nelly Moser plant. Clones of any plant are propagated by root, leaf, or stem cuttings, by grafting, or by some other method of asexual propagation. My seedlings arose from seeds that dropped from a pollinated flower, that is, the seedlings are the result of the sexual union of pollen and egg cells. Whatever jumbling around of genes happened during that union will be reflected in the plants’ growth and flowers. My first seedling flower spread open clear, blue petals -- beautiful. It’s a keeper. If I deem it truly and uniquely spectacular, I could give it a name and multiply it asexually to spread the joy. Then it would become a named variety or, to use the more professionably acceptable term, “cultivar,” from the words “cultivated variety.” The word “cultivar” grates on my ears; I refuse to use it. That unspeakable “c” word came about because the word “variety”was too general; it could mean two different things, plantwise. One meaning is a garden variety, as in Nelly Moser clematis. The other kind of “variety” is a botanical variety. 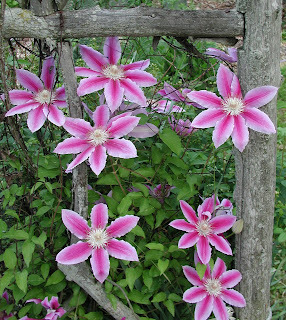 The flowering habit of my clematis seedlings is also of interest. That is, when does it flower? 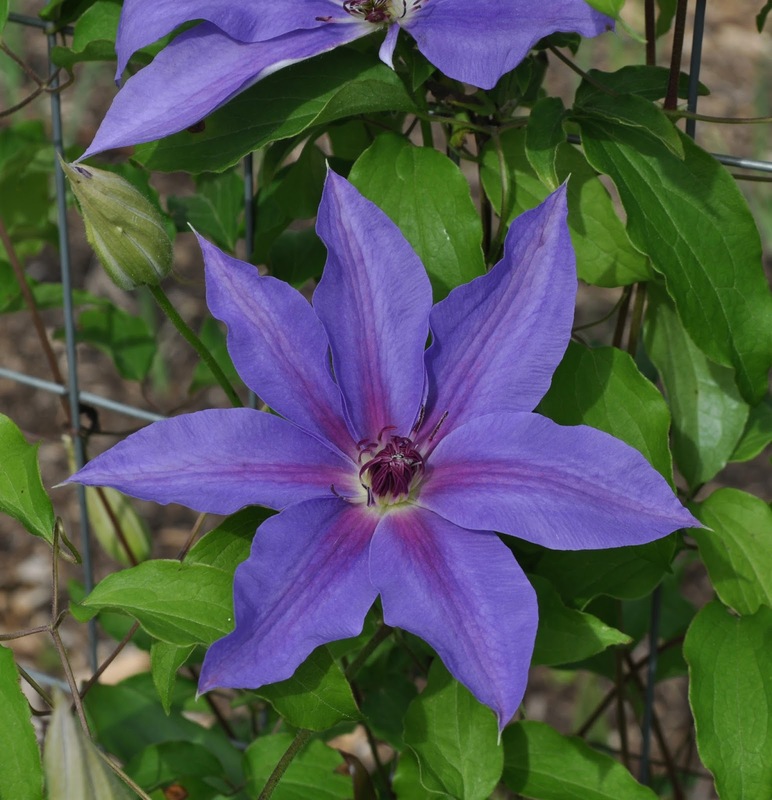 Some clematis flower only on new growth, which means they flower later in the season. 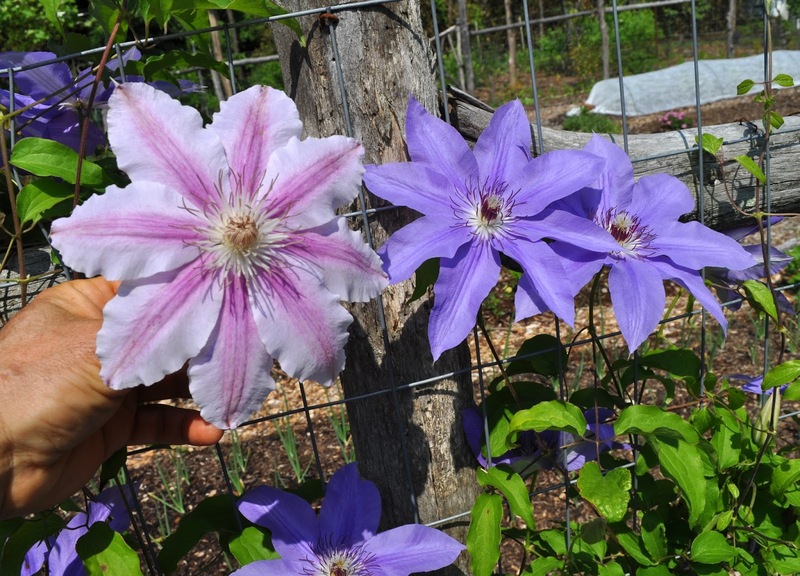 Some clematis flower only on old growth, which means they flower early in the season. 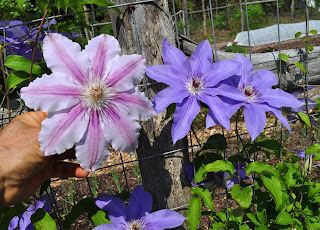 And still other clematis flower on both new and old growth, which means they flower early and late, over a long season. presumably will be similarly inclined. That is the case with the seedling that recently unfolded its blossoms. But it could flower again this season. For now, I’m enjoying the flowers of the first bloomer and looking forward to what unfolds on the stems of other seedlings. “How to Grow a Lot of Vegetables with Little Space, Time, and Effort” is the topic for an upcoming workshop I’ll be holding here at my farmden in New Paltz on June 23rd, from 9 to 11:30 am. (The growing season is still young: It’s not too late to get more out of your garden; it’s not even too late to start a garden!) The cost is $50 and space is limited so registration is necessary. For questions or registration, contact me at garden[at]lee reich.com. than a month after that, the plants will be ready for their permanent home in the garden. That might be where early bush beans or summer squashes had been sown, harvested, and cleared out of the way. The point is that autumn’s broccoli and cabbage plants, although sown in early June, need not take up space in the garden until late in July. As I wrote a few weeks ago, information on frost dates, both the last spring frost and the first autumn frost dates -- can be gleaned by choosing a state from the website http://cdo.ncdc.noaa.gov/climatenormals/clim20supp1/states/ and then finding weather data for a nearby location. That nearby location for me is Poughkeepsie, NY, for which there is a 50% chance of the temperature dropping to 32°F on October 9th. I figure when to plant broccoli and cabbage by counting back the number of days these plants need to reach maturity from the average date for the first killing frost. And then I add more days because I don’t want to necessarily wait until that first frost date before I can start harvest. •August 1 - September 1: multiple sowings of spinach, small radish varieties, mâche, arugula, mustard greens, and pac choi type Chinese cabbage in garden (early sowing will likely bolt but later sowings will press on late into autumn); keep planting lettuce. All plants growing in seed flats are transplanted out to the garden as soon as they begin to grow too big for the flats, which is typically four to six weeks after seeds are sown. 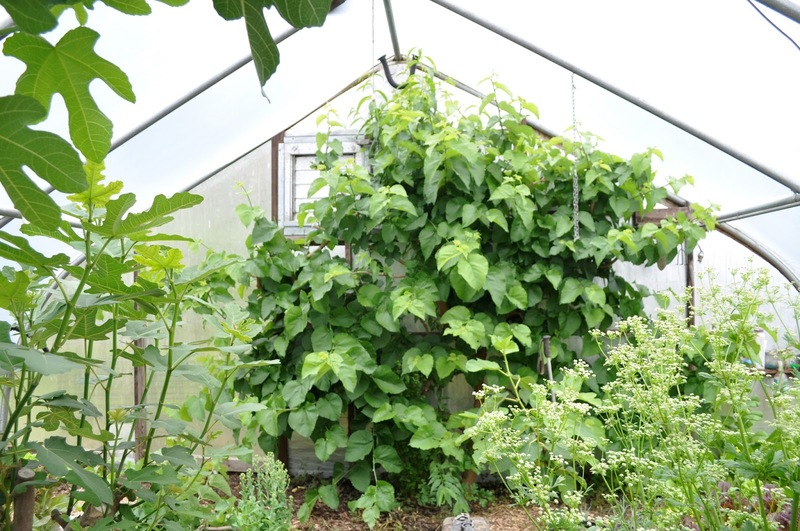 Multiple plantings of bush beans and cucumbers are ways to keep ahead of bean beetles (yellow, with dark spots) on the beans and striped cucumber beetles (yellow, with dark stripes) on the cukes. 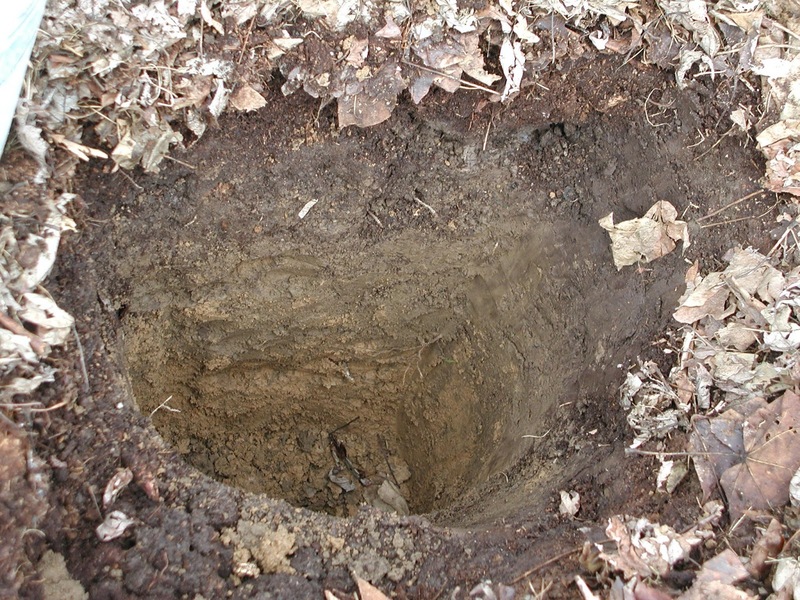 It takes awhile for new plantings to get attacked, and that attack is mitigated by whisking the old plants, with potential attackers still feasting, out of the garden to the innards of the compost pile. Multiple plantings also help with summer squashes’ squash vine borers, evident from wilting leaves and a sawdust-like frass that oozes out of stem, although I’m usually glad to be rescued from excess-squash-syndrome by the time the borers take plants down. The above schedule omits a few vegetables. Carrots: I don’t grow them, but if you do, July 15th is the date to plant them around here. Some people have luck with autumn peas. I don’t because first it’s too hot for them and then it’s too cold for them. Still, if you want to take a chance, sow them August 1st.